Second in the trio of White Star Line's superliners planned to dominate the lucrative north Atlantic passenger sea routes, RMS Titanic launched from Harland & Wolff's Belfast shipyard on 31 May 1911. Timed to coincide with her sister ship Olympic's departure from the yard, White Star achieved the desired publicity with around 100,000 witnessing the grand occasion. Designed for luxury rather than speed, Titanic was undoubtedly one of the most elegant liners built during the 'golden era' of sea travel. Due to high winds on 1 April 1912, her brief builder's trials were postponed until the next day. On 2 April, tugs arrived around 6am to ease Titanic into Belfast Lough where the massive liner could proceed for the first time under her own power. She then underwent rigorous tests within the enclosed waters of the Lough until, in the early afternoon, she headed out into the open Irish Sea for running trials. Steaming south for two hours brought her opposite the Mourne Mountains and St John's Point lighthouse, County Down. Here Titanic carried out a broad 180-degree turn before heading back to Belfast to receive her Board of Trade passenger certificate, "... good for one year from today, 2-4-1912". After handing over to her owners, the liner left around 8pm for Southampton and in the darkness, bade farewell to the coastline she would never see again. In his research, artist Gordon Bauwens consulted the ship's builders, The Ulster Folk and Transport Museum, The Belfast Port Registry and the lighthouse keeper at St John's Point, to ensure the accuracy of his portrayal of the event. 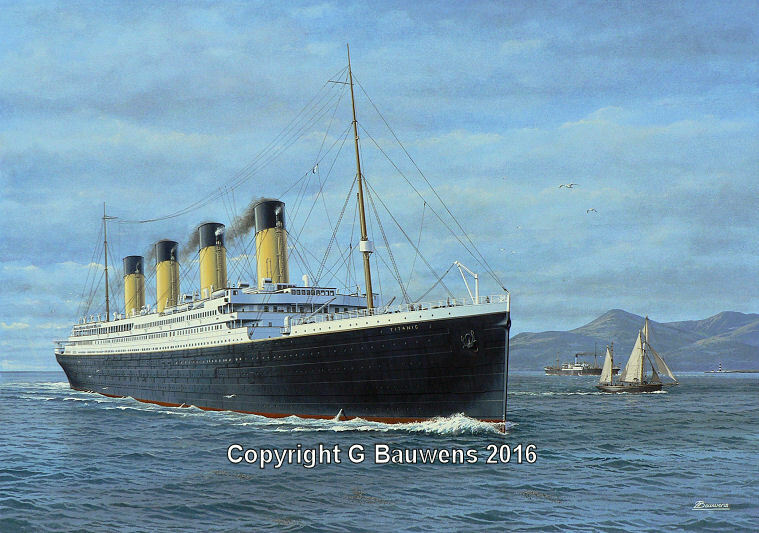 In his distinctive highly detailed style, the artist created this piece for enthusiasts to appreciate Titanic as she would have appeared on this proud day of celebration. From an original gouache painting by Gordon Bauwens. 550 Limited Edition prints and 55 Artist Proofs each signed & numbered by the artist.